Two Way Tuesday is back, my friends! And because I have been so MIA, I am actually going to show you THREE ways to style this adorable Draper James dress that I’m obsessed with. 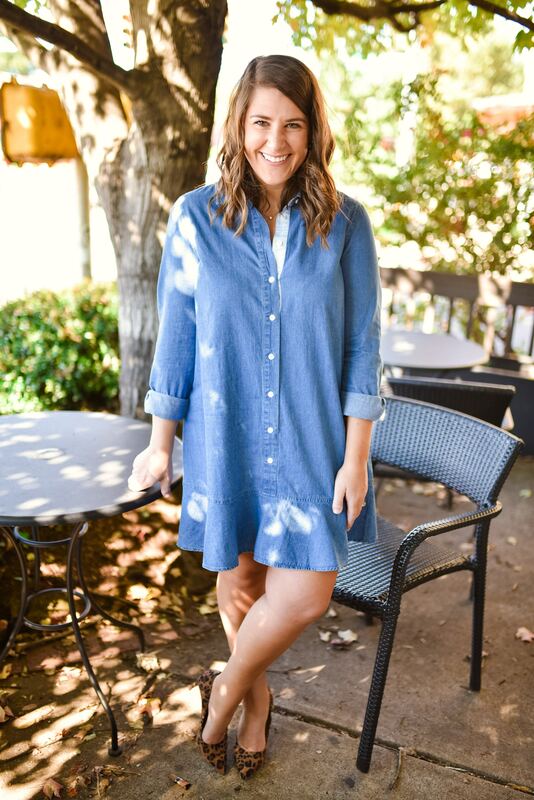 I absolutely love chambray in the fall and this dress can be worn for some many different things. I mean, seriously, how cute is this dress?? I got it on super sale from Draper James and I was honestly super hesitant about buying it. The brand itself is pretty pricey and I was nervous to pull the trigger. They had a huge sale a few weeks back and I bought several pieces. Everything is so well made and fits beautifully. While it may be a pricey purchase, you can bet that Draper James will be worth it. I love the ruffle detail at the bottom and wearing it with some cheetah heels and basic hoops makes it great for work or for a weekend brunch. I love this look for Saturday in the fall. The simple cardigan totally changes the look. Add mules a viola! I absolutely LOVE this last look for a baby shower! The pink really makes it pop. I love the way the cuffed sleeve looks. It is so classic and preppy. I hope you love this dress as much as I do! It’s still on sale, so snag it while you can! This dress is so so cute! Love the way your styled it!